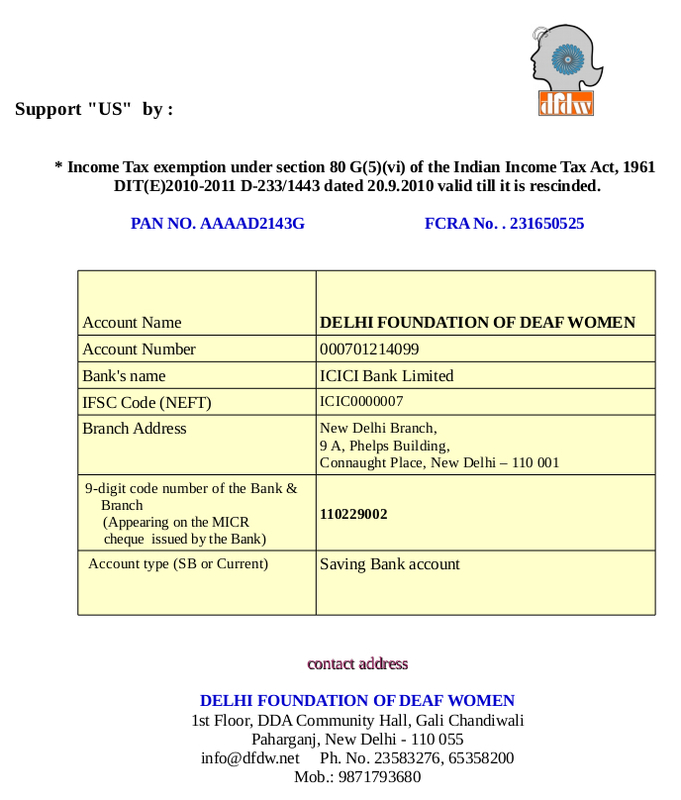 Laid on the foundation stone of Abraham Lincon's famous slogan "Of women by women and for women", the Delhi Foundation of Deaf Women, in brief DFDW, was established in January 1973.The newly founded organization caters to the welfare and well being of deaf women in the NCT of Delhi. At outset it was a mere club with strength of 25 members. Gradually the organization was converted into a well-established NGO whose strength shot up to 200 members. It acted as a Catalyst in the formation of state units in India. Silence has its own language and this you can see at Delhi Foundation of Deaf Women where a group of deaf women have shown eminence growth in all aspects that too being silent through out these auspicious 36 years. To meet the ever-increasing demands of the very aware – very intelligent deaf women, the DFDW introduced various Rehabilitation Projects in field of Education, Vocational Training, Crafts Workshop, Sports, Culture and Social programs. 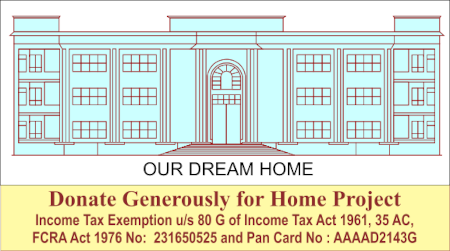 One of the Social programs, which are also the first of its kind, is by the name "Pranay Milan Sammelan”. The need for such a platform was felt to help the hearing impaired boys and girls, along with their parents,( who actually are instrumental in finalizing the alliance, ) to meet potential candidates. The principal objective of this sammelan is "come, see, and suit you". Based on this principal, the Pranay Milan Sammelan came into existence in 1992. The sammelan is open to all irrespective of caste and creed, poor and rich. The sammelan provides equal and good opportunities to all. This sammelan helps them to avoid waste of time and embarrassment of meeting new people. In short Delhi Foundation of Deaf Women acts as a "Connecting Link" with those who seek matrimonial assistance. However at no stage does the Delhi Foundation of Deaf Women enforce parties on choosing a particular match. An alliance has to be mutually agreeable and suitable to both. Through out the year we maintain the record of the applicants and annually we organize a Sammelan i.e a get-together ceremony to bring all the applicants under one roof and give them an opportunity to meet each other along with their parents or guardians. However, at the sammelan, the DFDW encourages parents and the prospective boys and girls to interact freely with each other - the parents through speech and the Boys and girls through the Sign Language to help them know each other. After introduction both parties meet each other for further discussion. They exchange addresses and phone numbers as well as make appointments for next meeting. We feel proud to be of immense help to them in this concern. The DFDW circulates booklets containing bio-data of boys and girls, their testimonials, salary certificates and other documents, and maintains strict confidentiality. The wedding cards are also kept for records. However, to offset some of the expenses incurred by the DFDW on this event, it does accept donations. Delhi Foundation of Deaf Women blesses newly married couples with gifts at the next sammelan, to help the couples start a new life. This event has seen successful culmination into matrimony of many couples where the children born are hearing and very healthy and normal. The matrimonial service extends to neighboring states. It gives immense pride to know that other local organizations are emulating our Pranay Milan Sammelan Program. We wish that every family attending this sammelan finds a suitable match for their ward and pray to god to bless them with a happy life ahead.